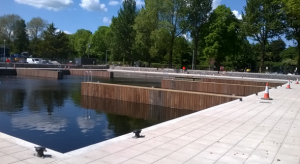 Waterways Ireland is delighted to announce that Portumna’s Castle harbour opened to vessels for berthing the first weekend in June following extensive renovation and upgrade. The harbour works included the doubling of mooring capacity at this ever popular location, upgrade of berths, re-paving of quay area and installation of cut stone walls. While the Harbour is now re-opened for boats, works to the onshore services including the upgrade of the service block, car parking, services for camper vans and access road continue and are expected to be completed in early September. The project is funded through the Lough Derg Stimulus Fund (administered by Fáilte Ireland), by Galway County Council and Waterways Ireland. Éanna Rowe, Regional Manager, Waterways Ireland said “I am especially pleased that the harbour is re-opening this weekend to boats and given the increased capacity now in the harbour I am full sure that Portumna can continue to benefit from the Shannon and its inland boating fraternity”. Mr. Rowe added that he wanted to complement the Waterways Ireland Operations Team for their efforts and endeavours in providing yet another top class waterway product on the Shannon Navigation.